A beautiful property, Maxorata Beach Club in Corralejo excites your mind and thrills your senses with its plush exterior décor and luxurious façade. At just a 4-minute walk from the beach, this Maxorata Beach Club offers direct beach access for those seeking some beach fun. The famous and popular Corralejo Beach is just a kilometre from here. The endless blue waters of this scenic beach are sure to rejuvenate you like never before. A perfect place for couples, the hotel offers the perfect solitude and privacy. There are plenty of local shops to explore here. One can also find several local bars, restaurants and shops close by as well. These local places give the tourists an insight into the city culture. The area of Corralejo where the Maxorata Beach is located is delightfully serene and tranquil. 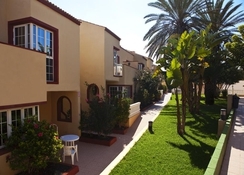 It is a quiet residential area at 500m from the town. One should visit the spectacular sand dunes at just 2km from the property. A quaint little ferry port is also thronged with tourists who want to travel to Lobos or Lanzarote. The Maxorata Beach club is an ideal budget property for families seeking a beach holiday at affordable rates. Tourists can get here by land or by air. The Fuerteventura Airport is 39.4km from here. For those planning to come by road, the hotel does not have any parking space. A friendly front desk is available for assisting the guests and they understand English and Spanish languages. All the apartments here come with private balconies or terrace spaces. A kitchen with an electric hob is provided in the apartments where you can do your own hygienic cooking. These kitchens also have a microwave, coffee maker and toaster equipment. Every apartment also has a bathtub. The bedrooms feature twin beds. For large families, these apartments also have sofa beds in the living or dining rooms. One can find hair-dryers in the bathroom and can also request for a safe. Being an aparthotel, Maxorata Beach Club allows for guests to cook their own meals. The onsite snack bar offers light bites and delicious refreshments. There are several local restaurants and eateries close to the hotel that allow guests to explore local cuisine. The hotel features two swimming pools, one for adults and the other one for little children. A large number of sun beds are available by the pool where in you can just soak some sun. On the recreation front, one can find pool tables. The hotel has a rooftop solarium and laundry services. While here, you can stay connected with friends and family enjoying the free Wi-Fi facilities available at the public areas of the hotel. Bicycles for rent are available here. Guests can hire bicycles and explore the nearby places. If you have pets, you can bring them along at an additional fee of $5 per night. The hotel also arranges for shuttle service at an additional fee. Car rentals can also be done on prior booking basis. One of the most sought after properties, Maxorata Beach Club hotel is a must-try in your next visit to Corralejo.